Deluxe Personalized Black Meeting Totes Custom Printed in Bulk. Promotional, Premium Polyester Canvas. Budget Prices in America. Bulk deluxe totes made of heavyweight, 600D water resistant polyester canvas. The main compartment of this tote zippers shut to secure items when on the go. 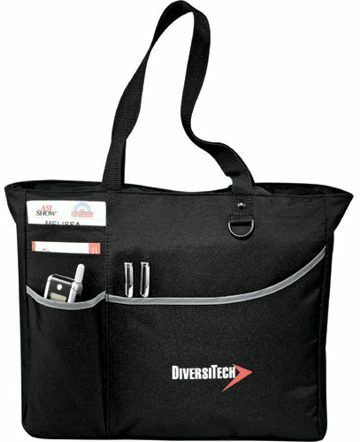 The deluxe meeting tote comes with multiple pockets and a D-ring on the front to allow for easy storage of cell phones, pens, keys, business cards, and water bottles. 11" handle drop height. Ideal for Conventions and Trade Shows. Must-haves for the meeting season. 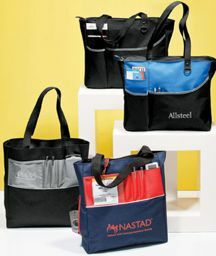 Unit prices below include your 1-color custom imprint, or they are for blank (not imprinted) deluxe meeting totes. Embroidery and full color imprint are also available: contact us. Set up Charge: $45.00 per color, $25.00 on reorders. Production Time: 3-10 days after art approval. Colors: Black with Black, Red or Royal Blue Accent (see photos). Other custom colors available with 45 days delivery. Dimensions : H 13.00" x D 3.5" x W 15"